The exhibition THE STUBBORN LIFE OF OBJECTS III marks the completion of Yuka Oyama’s artistic research fellowship at Oslo National Academy of Arts. Oyama has been exploring how and why certain domestic objects trigger our imagination, take on a life of their own, cause inconvenience – in short, make us behave differently. Yuka Oyama’s artistic practice combines contemporary art, art jewellery, wearable sculpture, performance, film, and material based art. 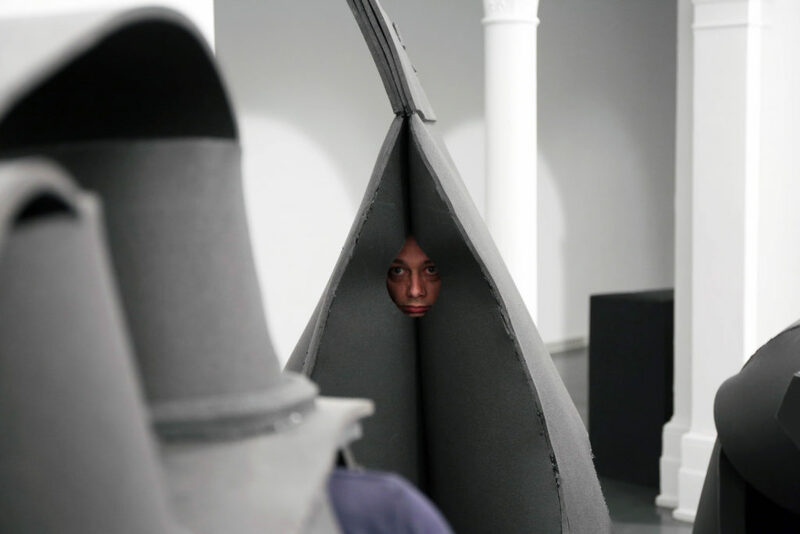 Based on this cross-disciplinary approach, she has established a method to explore the intermediary relations between a person and an object by constructing life-sized wearable objects that allow a person to become the object. In the course of her artistic research, Oyama has implemented cross-disciplinary research in cooperation with diverse groups of people – such as mime dancers and object theatre actors, the artist’s Karate colleagues, young adults and seniors, collectors of unusual things, as well as students from the Norwegian Theatre Academy and Oslo National Academy of Arts. The result is a series of film pieces that feature a distinctive dose of slapstick humour. The films depict strangely mechanical humans, futuristic human-object rituals, and the unpredictable gestures of objects. 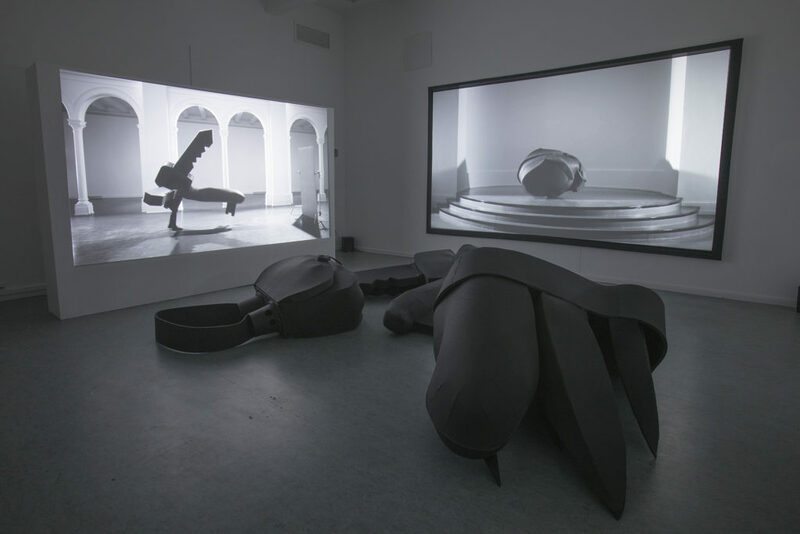 The exhibition comprises the installation THE STUBBORN LIFE OF OBJECTS III, the two film works Stubborn Objects Psychodrama and Encapsulation Suits, as well as a live performance of the sculptures. Viewing the whole cycle of works takes 25 minutes. The cycle will be repeated four times on 10 and 11 May: 17:00, 17:30, 18:30 and 19:00. Yuka Oyama was born in Tokyo in 1974 and grew up in Malaysia, Japan, Indonesia, USA and Germany. Living in many countries and cultures has shaped Oyama’s interest in the construction of identity and material culture as means to overcome linguistic inadequacies and to claim individuality. She studied Contemporary Art Jewellery at the Rhode Island School of Design, where she received her BFA; MFA at the Munich Academy of Fine Arts under the tuition of Otto Künzli (Art Jewelry) and Asta Gröting (Sculpture/Multimedia/Performance). Oyama has exhibited internationally since 2002.